Last week, my friend Cyd and I went to the Thomas Edison Historical Park in West Orange. Cyd owns the website, New Jersey Isn’t Boring, so if there is something unique or interesting in the state, she’ll know. I’ve been enjoying traveling the state and learning new things. To be honest, I didn’t realize Thomas Edison worked in New Jersey. Many of his most well-known creations were all created in West Orange! If you’re ever in the area, I highly recommend checking out the site. It was one of the more interesting and historic sites I’ve seen. At the very site we visited, he created the motion picture camera, improved phonographs, sound recordings, movies and the “nickel-iron alkaline electric” storage battery. After eating at a diner, we headed over to the Thomas Edison Historical Park. Here is a little bit of information in case you are interested. 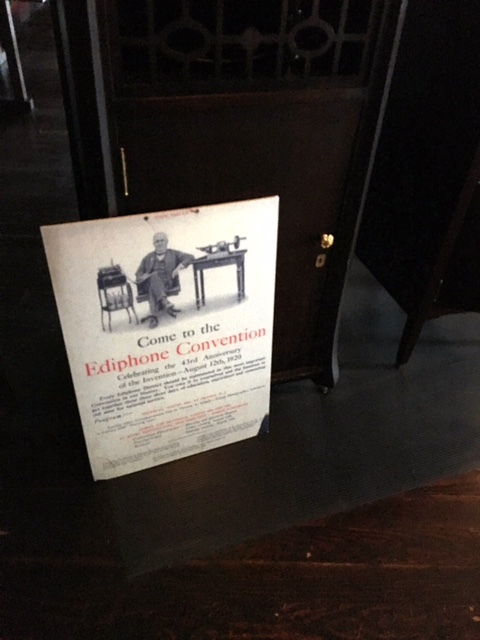 The Site itself hosts both Edison’s home as well as his lab site. It was designated as a National Historic Site in 1955. It was closed for several decades, and it reopened on March 30, 2009. During its closure, it was in service and used to manufacture several of Edison’s inventions. After renovations on the entire lab complex, it was completely reopened for visitors on October 10, 2009. Behind that wall he created the first motion picture. Also important is where the first waffle irons were created. How would I have my prerunning breakfast (waffles) without it? This is his desk exactly as he left it. The museum took about 2 hours to view. I highly recommend it, if you’re ever in the area. What was the last museum or historic site you’ve been too? Are there any historical sites in your local area? This looks like a neat museum. I’m glad you got to visit it with Cyd (sounds like she has a great website too) and see the neat stuff, but that talking doll is pretty freaky! We have quite a few historical sites here in Charleston, many of which are related to the Civil War (Fort Sumter, Plantations, various monuments). It’s not the prettiest time in history, but it is very important to learn about so that it is not repeated. Also, a lot of cities have monuments and memorials that people don’t know about- we have a Holocaust memorial here that I’d driven by for years and never knew what it was. So cool! What an interesting place to visit. The doll creeped me out!! Did you get to go to his homestead down the block? We did not because it’s only open on Sundays. Have you been before?